Multiplication tips and tricks to help you memorize the tables. Easily learn multiplication facts with these flash cards and engaging drill and practice multiplication games. Kahn Academy videos to help you learn how to do multiplication. 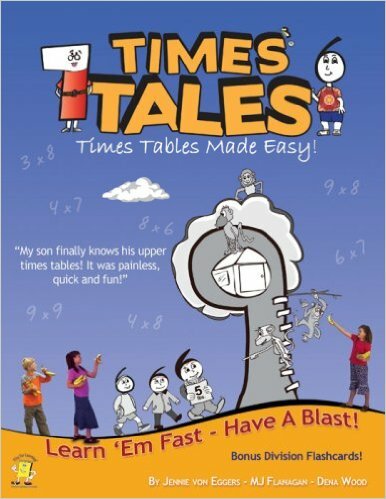 Times Tales is a creative, innovative mnemonic-based program that makes it fun and easy to memorize the upper multiplication facts. Times Tales uses cute, simple stories to provide students with a “memory peg,” allowing them to quickly recall otherwise abstract facts. Follow the 12 steps to easy multiplication and you will find that multiplication becomes so easy. Most people find that they only need to be shown these steps once. Flash cards are a great way to practice the times tables. The flash card printouts are two sided. First print out one side, put the paper back in your printer to print the back side. Race against 3 other people. Cars speed ahead with each correct answer, but yours needs to come in first. Other races and difficulties available. Helps learners understand their times tables as well as remember them. The number grid can be used on smart phones, tablets, computers and interactive whiteboards. Interactive Number Square allows learners to explore the times tables through the visual patterns produced on a 10 x 10 grid by the numbers in a times table. What about times tables? The fascination some parents have with the magical power of knowing times tables amazes me each time I hear that question. I stopped counting up around the fiftieth time. By Sandra Dodd. Interactive games to help you memorize the times tables and play games with what you’ve learned. How to Play: Select “multiplication.” FUNBRAIN will give you a math problem. Enter the answer to the problem and hit the “Swing” button. Nice table to print out and use to help find patterns or make up games. Make up your own rules and see what happens. For example, decide to color in all the multiplication facts that end in ‘1’ or in which the numerals add up to ‘9’. Math Forum members give you tips on how to appear to be a multiplication genius. If someone dumped a jar of pennies in front of you and asked you to count all of them, how would you approach the task? Just Relax and Cheer Up! Today I am about to tell you the Secret of Faster Math. I will teach you some of the Easy Calculation Tricks of faster Math.